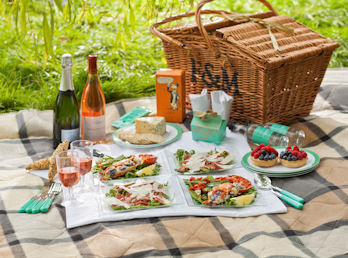 With weather like this there is only one thing on everyone's agenda...sun, BBQs, Pimms and picnics! Al fresco dining is a must whether it be in a big group, on a date or even a quick lunch break to escape the office mayhem. When we were younger there was nothing us Mice liked more than packing up the picnic basket, blanket, cricket bat and heading down to Verulamium Park for a fun packed day filled with games and feasts! There's nothing like a competitive Robinson game of cricket followed by scotch eggs, finger sandwiches and fresh strawberries and cream! Ranging from £40 - £200 you can bag yourself a simple feast of smoked salmon sandwiches, coronation chicken salad followed by Eton Mess or opt for full on luxury and nibble on beef carpaccio, dressed lobster, a cheese course, champagne truffles all washed down by sparkling wine from champagne flutes! I know which one I would go for...! The trusty restaurant chain has once again ticked all the right boxes - quality Italian food at reasonable prices, but this time all packed up and ready to go! Vegetarian (£45 for 2 people) consisting of Antipasti, Focaccia, goats cheese tarts, pearl barley salads and strawberry balsamic tarts to name a few! The Classic (£45 for 2 people) which is pretty much packed with the same goodies but with the addition of cold meats and corn fed tarragon chicken thrown in for good measure. The final option The Bambini (£10 for 1 person) a picnic for little ones - this is filled with simple courses, such as portions of salami, soft cheeses, pizza, meatballs and of course some sweet treats! 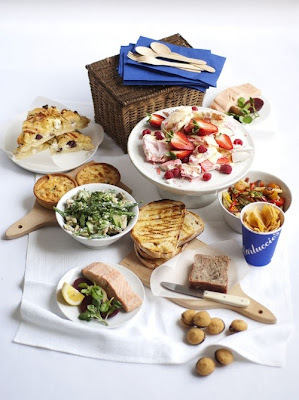 There's also an option to add a bottle of wine or prosecco to your picnic for a mere £8.50! Our favourite Shoreditch brunch haunt has also piggybacked on this trend offering consumers the chance to order up luxury hampers - believe me anything from the Albion is a treat! Their breakfasts kick any hangover - the plates of cakes, biscuits and tarts are DELICIOUS, their fresh bread is so moreish a no carb diet would be impossible to adhere to within 2 seconds of entering and the simple roast chicken sandwich on their menu is by far the best sandwich I have ever tasted. 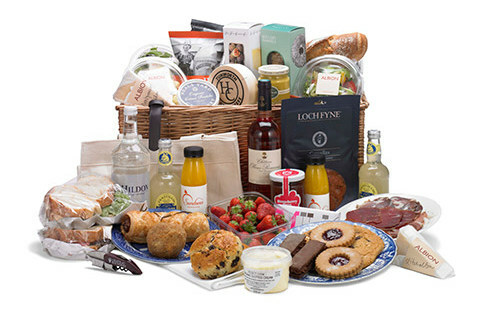 The chance to therefore have an entire hamper full to brim of their scrumptious goodies would be an absolute dream!! For £140 you can pick up a banquet serving 2-4 people and to do it justice I am going to tell you everythingggggg it includes!!! Here goes: Scotch egg, sausage roll, roast beef & horseradish sandwiches, chicken mayonnaise sandwiches, homemade sourdough baguette, smoked Scottish salmon, whole Tunworth soft cheese, Montgomery’s Cheddar and Stichelton, cheese biscuits, piccalilli, selection of British charcuterie, roast vegetable salad, potato salad, tomato salad, mixed leaf and herb salad, two flavours of Tyrells crisps, English strawberries, clotted cream and créme fraiche, scones from the Albion bakery, strawberry jam, selection of biscuits from the Albion bakery, freshly squeezed orange juice, Fentimans Victorian lemonade, Hildon sparkling mineral water, Château Ollieux Romanis Rosé, Château Boundary corkscrew, Curious Chocolate milk chocolate bar and Romney's chocolate covered Kendal mint cake. WOW – I feel out of breathe just writing that!!!! 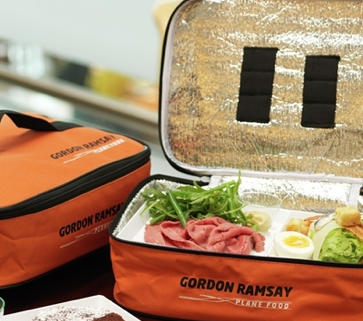 If you're flying from Heathrow Terminal 5 you're in luck, just pop by Plane Food between 7am and 9pm and pick up your carry on picnic which will set you back just £12.95 for 3 courses. You can pick from the likes of...Antipasti of buffalo mozzarella and salami or prawn cocktail to start. Roasted Hereford rump of beef with green salad and mustard or Cumbrian honey-roast and Parma ham with slow roast vine tomatoes for main. Finish off with a chocolate and pecan brownie with crème Chantilly or an English cheese selection with quince and berries. Sounds much more up our street than a shrivelled piece of chicken in grey sauce followed by a soggy fruit salad!